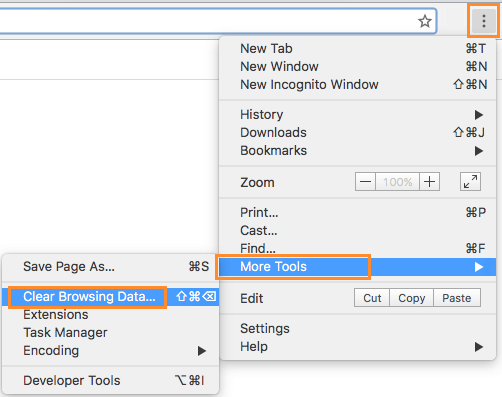 Here is how to quickly Clear Cache in Google chrome browser, in case you are concerned about your privacy or just want to refresh the Cache, in order to improve the performance of the web browser on your computer. The Cache in Chrome Browser can be defined as a temporary storage location on your computer that allows the Chrome browser to pre-store Images, Icons and certain sections of the websites that you frequently visit on your computer. If the websites or web pages that you revisit have the same elements, Chrome browser makes use of the data stored in its Cache, instead of downloading these elements again from the websites. This results in faster rendering of the webpages and considerable savings in bandwidth. This helps in faster loading of the webpages, reduces bandwidth usage and provides a better user experience, especially for users with poor internet connection. In case you are concerned about your privacy due to cached data being stored on your computer, you can simply Clear Cache in Google Chrome browser and remove this data from your computer. Cached data reveals details of your browsing activity and you can prevent this information from being accessed by anyone by clearing Chrome Browser Cache on your computer. Another reason for Clearing Cache in Google Chrome Browser would be to improve its performance, in case the Chrome browser appears to be slowing down, freezing or displaying badly formatted webpages. It is a commonly recommended practice to clear Cache in Google Chrome browser, whenever the browser appears to be having problems and also due to privacy reasons. 2. Next, click on the 3-dots Chrome Menu Icon located in the upper-right corner of your screen. From the drop-down, hoover your mouse on More Tools and click on Clear Browsing Data… option in the side menu. 3. 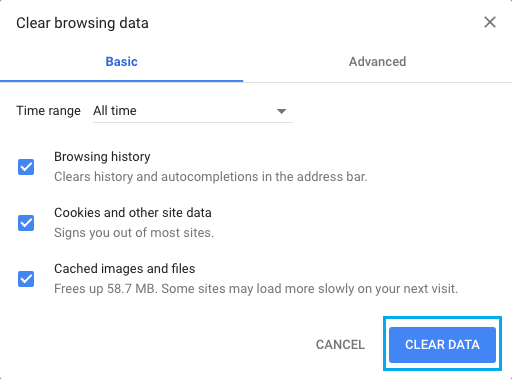 On Clear browsing data screen, select All Time as the “Time Range”and then select the type of browsing data that you want to clear from Chrome Cache. As you can see in the above image, we have selected to remove Browsing History, Cached images/Files and also Cookies and other Site Data to be removed from Chrome Cache on our computer. 4. Finally, click on the Clear Data button to clear Cache in Google Chrome browser. Once you click on Clear Data, all the selected Data types will be cleared from Chrome Browser Cache as stored on your computer. Note: Instead of using above steps, you can also use keyboard shortcuts to quickly clear Chrome browser Cache on your computer. While clearing the Cache in Google Chrome browser can help fix problems and protect your privacy, you should be aware that clearing the browser Cache may cause your favorite websites to load slower.